The kids, hard at work. Students of Onedia High School in New York are serious when it comes to eco-friendly creations. 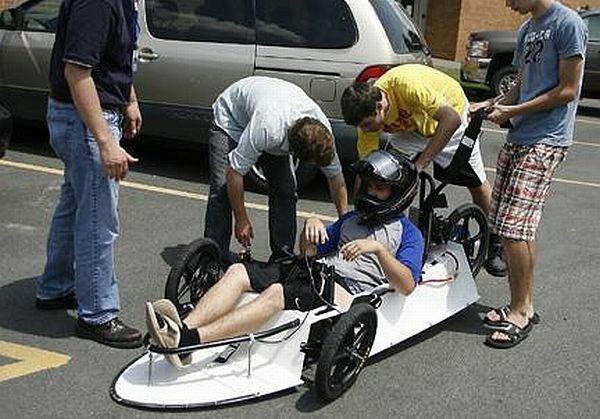 School seniors Jimm Davis, Sean Butler, Nathan Atkinson, William Atwal and Kyle Armstrong built an all electric car as part of their Engineering Design and Development class. This is a fully functional racer which tops off at 40 mph and is powered by a DC electric motor. The car also has no transmission and boasts a simple direct drive from the motor head to the rear wheel. These students are an example of the possibilities of green technology and the different options it provides. In honor of the work put in by the students, Onedia High School has decided to continue the project for their upcoming senior classes hoping that they will make improvements to the car.